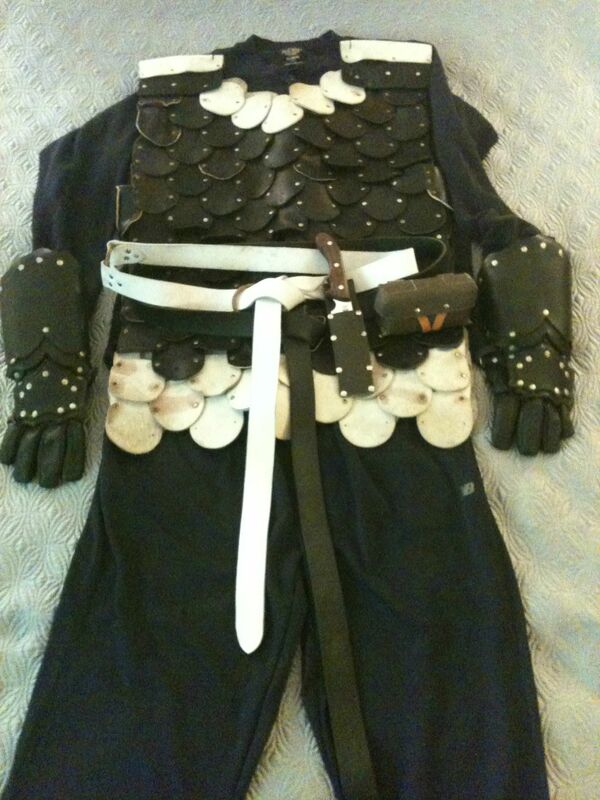 Here’s a look at my garb and armor at the moment. Let’s walk through each piece, and take a look at each. There are pros and there are cons to the look and the use of each item and there are plenty of areas where things can be improved. All this can be found in this gallery, if you just want to see the pictures. Tons of pictures below the jump! 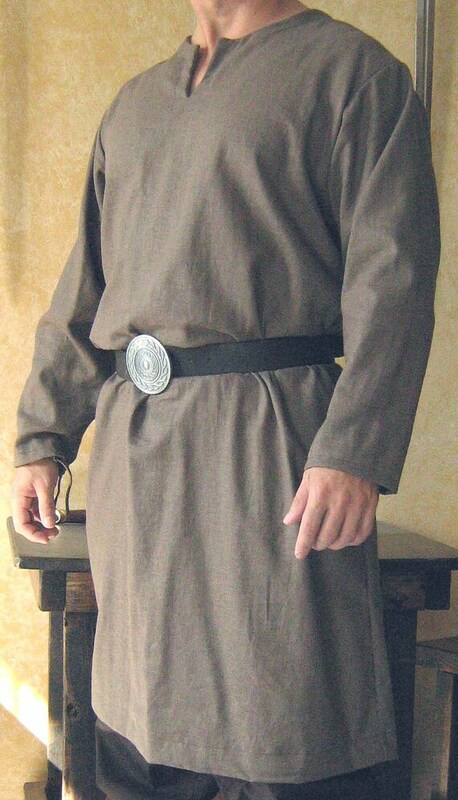 If you’re going to a larp for the first time, this is pretty good to wear. There are no labels, and only one small logo. 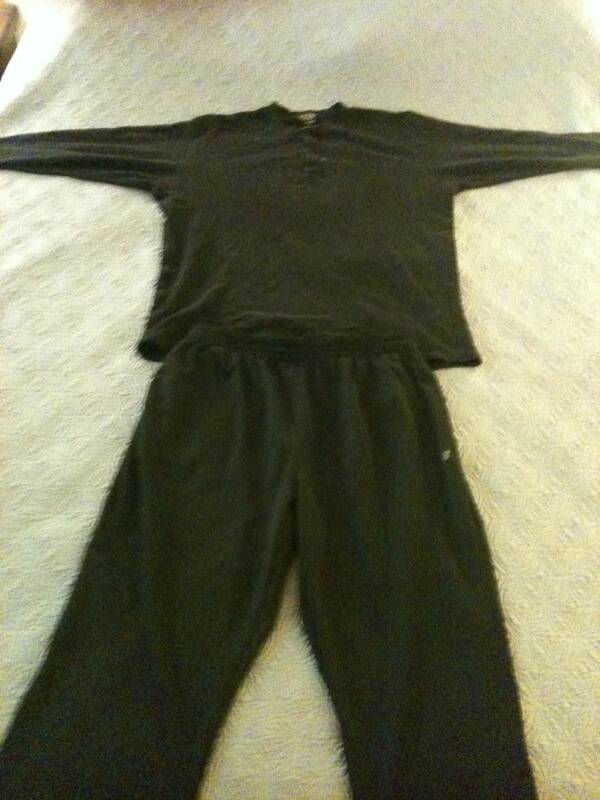 The shirt is a knit Old Navy 100% cotton shirt. Cotton is a relatively modern material. Linen or Wool are the real period materials. But Cotton is the oldest material still mass produced and therefore relatively easy to acquire. If not right off the rack, then check thrift stores, salvation armies, and consignment shops. The pants are work out gear. They are a modern synthetic material and should be the first thing to be replaced. They have one small logo, which gets hidden by armor. If you game system forbids modern materials, you probably won’t get away with these pants for long. These two items are vastly better than most new players bring to the field. They are fine for a first year player, and will go unnoticed on the battlefield. Even if the next layers aren’t added, a new player could get away with these pants and shirt, and perhaps a tabard thrown over for their first few events. 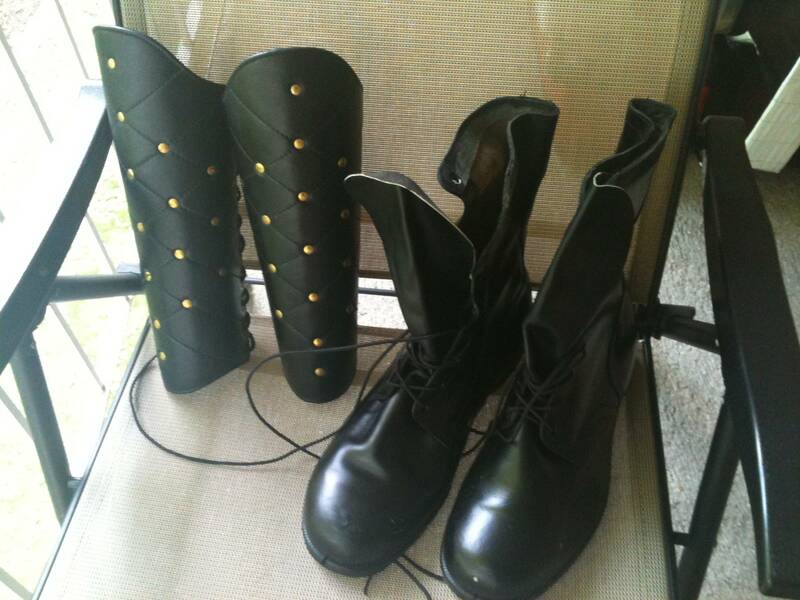 Anyone with any interest or ambition in larp should be able to replace these items with much better looking gear within their first year eventing. This layer is the one that needs the least work (paradoxically its the most fun layer to work on). All leather, all hand made and appropriate for all kinds of different time periods. The hauberk is riveted leather scales, which was constructed by myself (the leather scales can be purchased, punched, then riveted together). 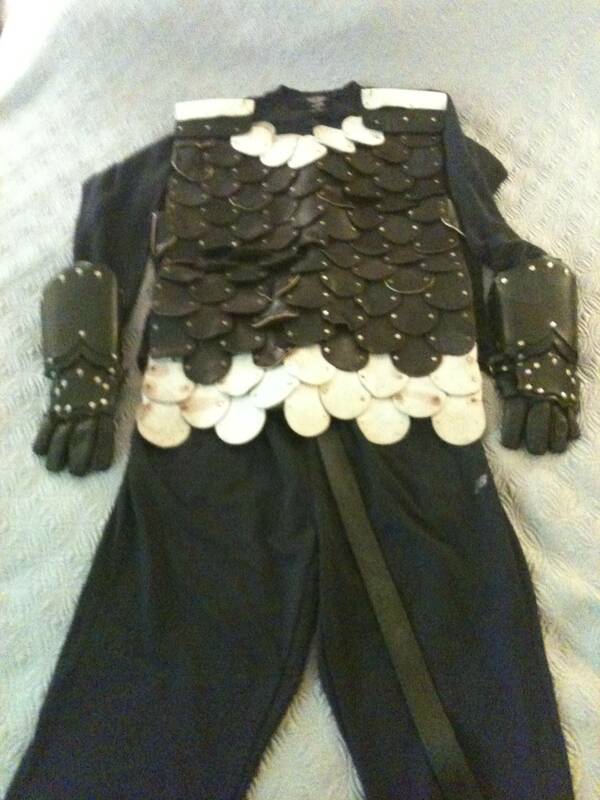 Not shown here are the chain mail sleeves I’ve added. The gap between the gauntlets and the shoulder left a big patch of upper arm unprotected. This took relatively little experience, and was fairly cheap. The comments I get at Ren Fairs are priceless. Also added some Leather Greaves on the lower legs this year. Purchased those through Amazon of all places. Hand made in India by one of the historic replica companies. They really protect the lower legs from rocks, stumps, and my own clumsy combat. Great to have and look good too. Added are a decorative belt, also hand made. A knife and sheath (you can tell I made that myself), and a World War II ammo cartridge case as a pouch. Although thoroughly modern the cartridge case looks as though it jumped right off the page of a D&D adventure. It looks great, and therefore passes where I play. But if you play strict period, it’s not going to work. 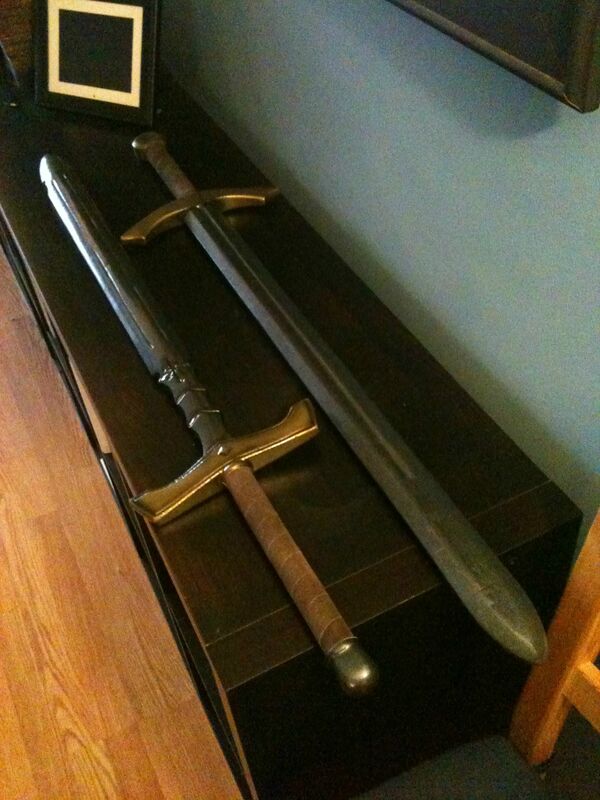 Two latex one handed swords, purchased from Craigslist (an amazing find)! They look amazing, function well, and last for years. Until Oct 2013 I owned 0 latex weapons. Now I have 3, and really would rather not go back to boffers (but still do all the time). These things are expensive! Expect to pay $70-80 US, plus shipping and handling for one sword. You can build boffer swords for $5 a piece, or buy them for $20 to $30. Not cost effective, but tons of fun. After larping for years, you tend to end up with things. Like this small collection of bizarre shields. 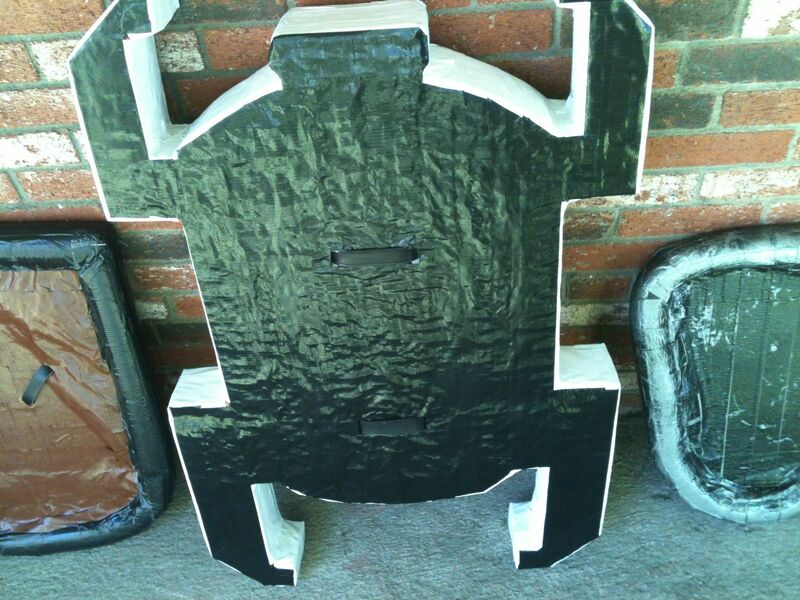 Classic heater style on the left (too small for me), Giant Foam Scarab Beetle in the center (which is my main shield). And a buckler on the right. The buckler was a fun build. Press board, with a trowel handle. Now looking objectively at these pieces they could come from a viking raider/farmer. So to further that look, the shirt would get replaced with a Viking Tunic. Picking all black may be fine for the armor, but not for the cloths. A natural color tunic, and probably brown color breeches would round out the look. The shield would have to go. Although it’s tons of fun, it really does not say ‘Viking’. So it should get replaced by something more appropriate.